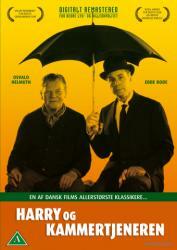 Comedy/Family, Denmark, 1961, 105 min. Synopsis Set in the late fifties in Denmark the poor junk yard assistant Harry inherits some money. He decides to use the money to hire a butler. The butler isn't too keen on the job at first, but he takes it because there aren't that many butler-jobs around at the moment. In the beginning both of them don't know what to expect of the other, but find a way to satisfy both of them. The people in the neighborhood at first make jokes about Harry and his butler, but in the end they start to accept him when he starts to help them.